Arriving from the highway A1 at the junction labelled “Bremer Kreuz” change to the highway A27 in direction “Bremerhaven”. 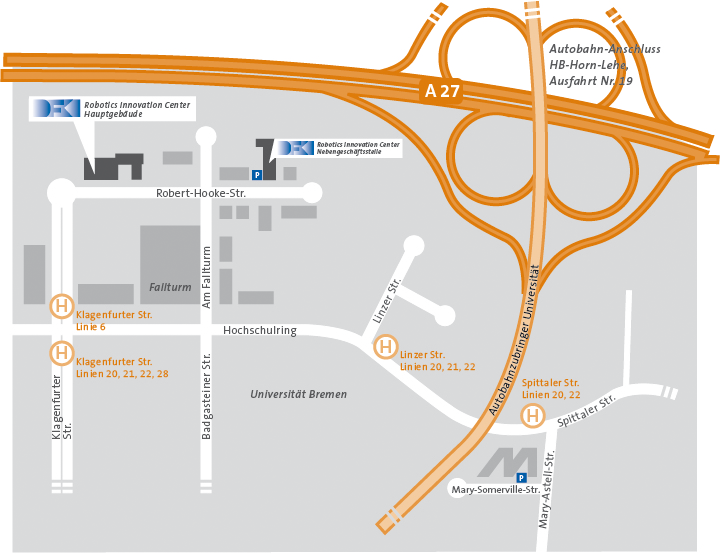 Leave the highway at the junction called “Universität / Horn-Lehe” (No. 19). Turn right at the second crossing into the “Hochschulring” then turn right at the second street “Am Fallturm”. At the next crossing you turn right again in the “Robert-Hooke-Straße”. Our building is the second on the left. 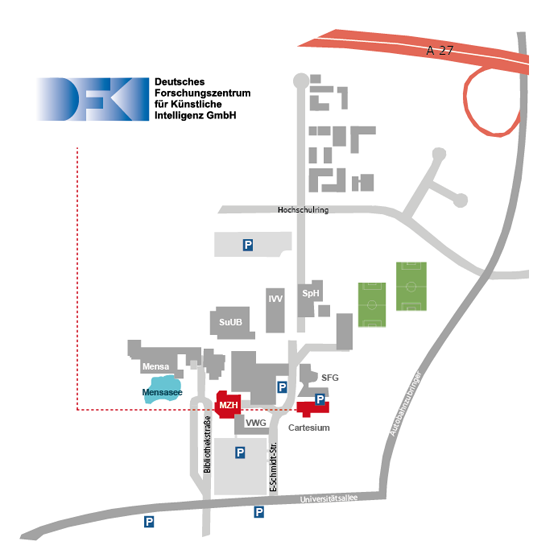 In front of the DFKI building is a large parking place. Exit the Bremen central station in the direction south (town center). Taxi and tram are leaving directly in front of the central station. Taking a taxi to the University of Bremen cost approx. 10,– Euro. It is cheaper to travel by tram: You take the tram no. 6 in direction “Universität” and exit at the terminal stop “Universität Nord”. From here you will have to walk 5 minutes. So keep following the rail till the turning radius and turn right in the ”Robert-Hooke-Straße”. Another possibility to get to the university is by taking the busses 21, 28 or 32. Taking a taxi to the University of Bremen will cost approx. 18,– Euro. The tram goes directly from the airport to the University of Bremen. Exit at the terminal stop “Klagenfurter Strasse”. From here you will have to walk 5 minutes. Keep following the rail till the turning radius and turn right in the “Robert-Hooke-Straße”. 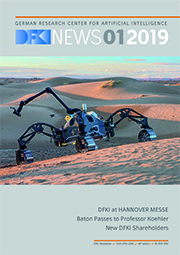 The head office of the research department Cyber-Physical Systems (CPS) is located in the 3rd floor of the Mehrzweckhochhaus(MZH) building at Bibliothekstraße 1 in Bremen. The reception is in room 3530. Further offices including the BAALL are located in close proximity in the Cartesium at Enrique-Schmidt-Straße 5. From the autobahn A1 change at “Bremer Kreuz” on the A27 in direction “Cuxhaven/Bremerhaven”. Leave the A27 at exit 19 “Horn-Lehe/Universität”. At the second intersection turn right into “Universitätsallee”, and at the next traffic lights turn right again into “Enrique-Schmidt-Straße”. Use the the parking lot there (parking fee € 0.70 per day in exact change). To get to the MZH leave the parking lot in the direction Bibliothekstraße. This is the parallel street to the Enrique-Schmidt-Straße. (When you enter the parking lot by car, the Bibliothekstraße is right in front of you). In the Bibliothekstraße turn right. The MZH is the high-rise building on the right side. To get to the Cartesium, leave the parking lot back to Enrique-Schmidt-Straße; the Cartesium is the first building on the right side of Enrique-Schmidt-Straße, easily distinguished by its bright red colour. Exit the Bremen central station in the direction south (town center). Taxi and tram are leave directly in front of the central station. A taxi to the University of Bremen is approx. € 10. It is cheaper to travel by tram: take the tram line 6 in direction “Universität” and exit at the station “Universität/Zentralbereich”. The Mehrzweckhochhaus (MZH) is in immediate proximity of the tram station. Another possibility to get to the university is the bus lines 21, 28 or 32. A taxi to the University of Bremen is approx. € 18. 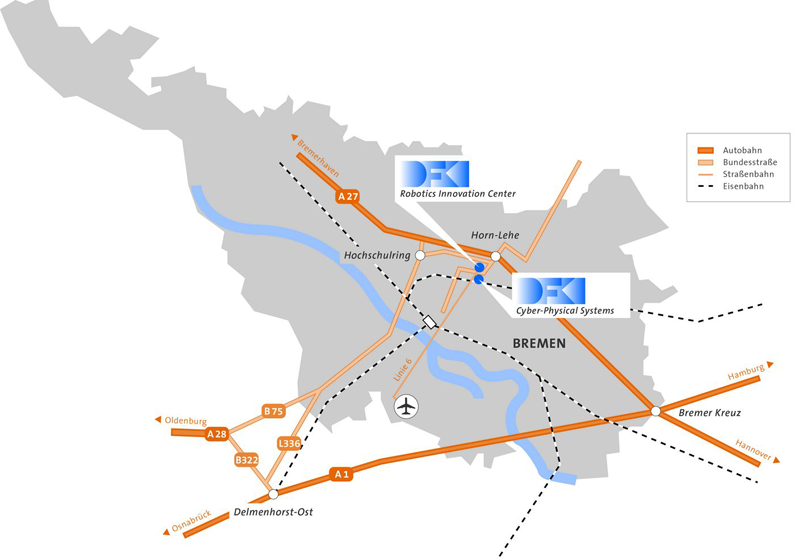 The tram line 6 goes directly from the airport to the University of Bremen. Exit at the station “Universität/Zentralbereich”; the Mehrzweckhochhaus (MZH) is in immediate proximity of the tram station. Information on hotels can be found on the website of the Bremer Touristik-Zentrale.